After purchase, we’ll send uploading instructions! Upload from any device and sort into your preferred order. Watch your film and make suggestions. We’ll edit, send you the link and your archival portfolios will be on their way! How do I get my footage / photos to you? Please take a few minutes to watch the video above. 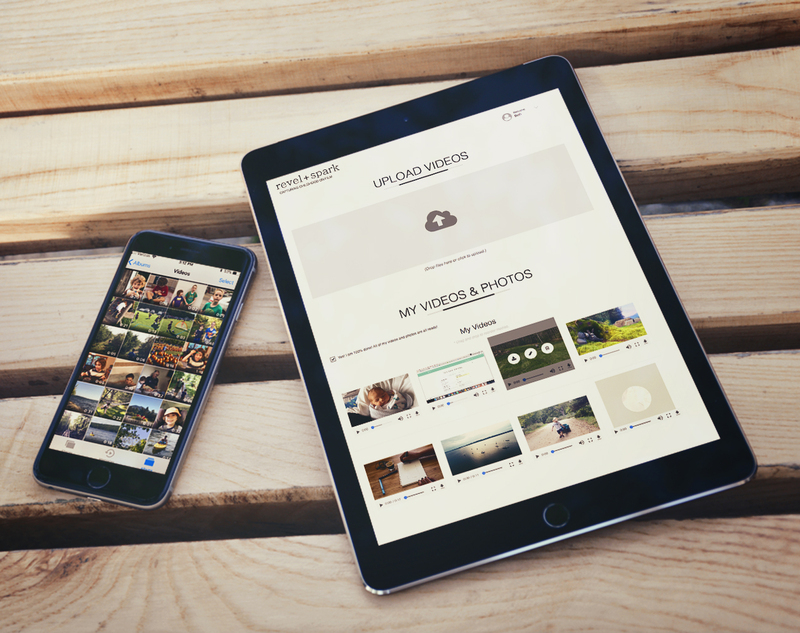 Our custom, upload tool allows your to securely upload your iPhone / smartphone, tablet or desktop files. Once you purchase your keepsake package, we’ll send detailed instructions. Using an app not your thing? We can also send you a large-capacity USB flashdrive. Can we chat by phone? Most definitely. Just get in touch! I’m overwhelmed! My stuff is everywhere. Don’t be. We’ll talk it through with you. Also, multiple family members can upload using our secure, custom app. For example, grandparents can help! Up to 10 business days once all material has been uploaded and a deposit has been paid. Express turnaround available. Our films are generally around six, fifteen or twenty minutes depending on the package that you choose. This depends on which package you select. We will work with you to determine custom pricing. Our goal is to make a well-crafted, meaningful product for you and your family. This takes time, skill (our professional editing team have decades of combined experience), care and equipment! Can I gift these to relatives and friends? Absolutely. You can order an extra flashdrive + Blu-Ray / DVD portfolios to send to loved ones. Our portfolios are customized hand-made linen boxes and are beautiful (and make PERFECT gifts)! We sure do! Send this page to a loved one. Can I show my film at special occasions? Please do! Our films are perfect for special celebrations such as birthdays, graduation parties, religious holidays and … maybe even a wedding someday! How do I share my film with friends and family? You can share via our private secure VIMEO account or you can upload your digital file to whatever platform you choose (ex. Facebook; YouTube). Tell me more about the archival portfolios? YES! Each package includes a specific number of archival portfolios that each include a flashdrive and DVD. Each portfolio is a customized, hand-made linen box and you can order more at checkout to send to relatives and friends as gifts. Are my files transfer secure? Absolutely. We use industry-leading AWS (Amazon Web Services) for data transfer. Can I choose my music? If you want to share publicly, it’s necessary to use royalty-free, licensed music (we have lots and are experts at pairing it with footage). If you are certain that your film will not be shared online via social media, then feel free to send us your favorite artists or musical genre — instrumentals are best. I want to be able to hear my kids laughing and talking. Can I? We use our expert editing skills to let your kids personalities shine through their dialogue, laughter, songs — you name it! You’ll have a chance to make note of this within your client media portal. Do you take photos, too? Yes! We understand that photos are important, too, and can integrate photos alongside your videos using professional zoom techniques (like the Ken Burns effect) and transitions. Yes! Please be in touch. Most likely, it’s just fine 🙂 Our job is to make it shine. Do you have tips for taking video? YES! Sign up for our 8-Tips For Better Filmmaking and follow us on Facebook and Instagram! My videos are on older — how do I send them to you? If you have videos still on a Flip recorder, tape or camcorder, we suggest using a trusted, local vendor for your tape-to-digital transfer. There are also reputable online services like LegacyBox (Get 25% off your first order by using code: MEMORIES25). Once the files are digital, you can upload via our app.